Tradition meets trendy at Teasim, a Japanese inspired teahouse serving tea, cookies, Japanese and Indian food with several locations in D.C. The Dupont Circle location features a funky, old wooden style tea house, while the Penn Quarter location calms with a full-fledged koi fish ponds and quiet atmosphere. 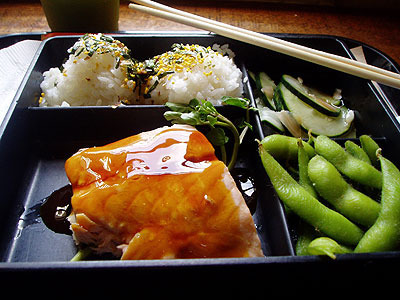 Spare a couple of hours for a refreshing tea, such as jinzhen, paired with a salmon bento box. Make another excuse to go back to Teaism for their locally famous Salty Oat Cookies or for a real example of fusion: tea cured salmon with naan and raita for breakfast. Annyeonghaseyo! The D.C./Metro area is one of the best places for Korean food. Don’t speak Korean? No problem. Fingerpointing to bulgogi at the menu at the Falls Church, VA based Han Sung Oak, or the “Kalbi King,” will earn you mounds of marinated Korean beef barbeque along with a sea of small Korean starters, called banchan, which include the all-famous kimchi, fermented cabbage and tiny, crunchy fishes that eat like potatoe chips. Stick around town for the new and trendy Dao Moim in Annandale, VA, the area’s newest Korean fusion restaurant and bar a la tapas style, where diners can sample galbi tacos and jaeyook quesadillas, and also make room for caprese salads and baked brie with honey. The Vietnamese bahn mi is a classic form of fusion- shredded steam pork wrapped in a baguette. It’s French on the outside, Vietnamese on the inside. Grab bahn mi on your way back to The District at Song Que in Eden Center in Falls Church,VA ( P.S.- Anthony Bourdain made a celebrity appearance here when scouring ethnic places to eat in and around DC). Ping Pong Dim Sum in Chinatown exhibits Asian fusion in ” little steamed parcels of deliciousness.” Pass through the fiery red, dragon laced arches of D.C.’s Chinatown to nosh on their trendy grazing menu, also tapas style. Nibble on maodou, steamed soybeans, followed by pork shu mai and steamed honey-barbequed pork buns- makes for an incredible breakfast.